The following options are used for the special cases. It is recommended to use all settings by default. The headers you choose won't be sent out. The destination address which you specify into the 'ForwardTo:' box will be put into 'To:' header. It will look like the email has been sent to the receiver directly. The destination address which you specify into the 'ForwardTo:' box will be added to 'Cc:' header. 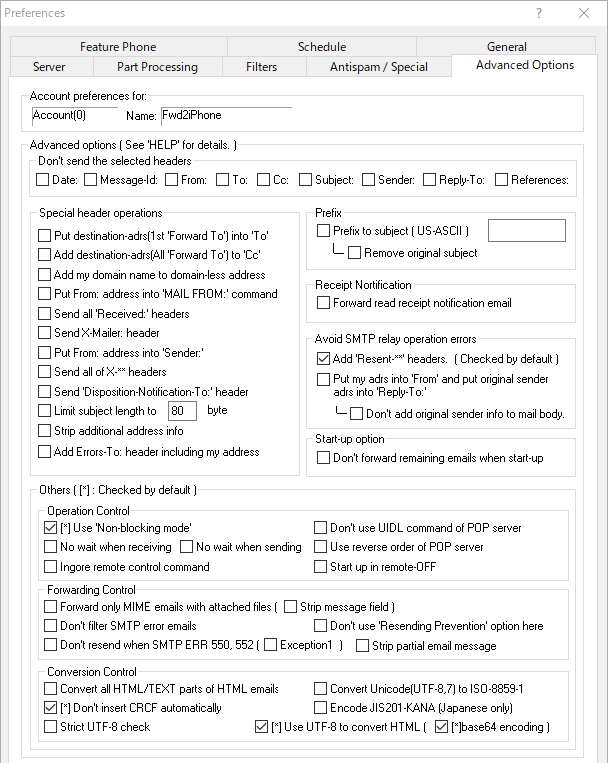 The sender's address in the 'From:' header field will be used for 'MAIL FROM:' command when connecting to SMTP server. This option is for one of the mobile phone services which displays the sender's address to mobile phone according to the MAIL FROM: command. Be sure that this option may cause another SMTP relay operation error depending on your SMPT server settings. All Recived headers added by mail server will be sent out. The X-Mailer header that shows the sender's mail client software name will be sent out. Your address specified at the mailbox information will be used for Sender: information. You may avoid the relay operation error depending on the server setting. All optional headers which start with "X-" will be sent out. The "Disposition-Notification-To:", which shows that the original sender requires the notification of opening the email, will be sent out. The subject portion that exceeds the specified bytes will be stripped when forwarding. For example, "Your Name"<your address@company.com> will be changed to just address@company.com whenforwarding. Add Errors-To header information that may be used as the return address from the mail server will be added. When the mail server would return an error email, the added information may be used and the error email may return to you. However, it depends on the server settings whether the header will be used. The remaining mails on your mailbox will not be forwarded when starting. The specified string will be added at the top of the subject. The number of prefix letters is limited up to 14. Just the US-ASCII character can be used. The 2-byte character like Chinese, Japanese and Hangeul cannot be used. In addition, if both this prefix option and the sub-option "Remove original subject" is enabled, the original subject will be stripped and only the specified prefix letters will be set to subject. This option enables read receipt notification emails to be forwarded. ForwardMail recognizes emails that contains 'disposition-notification' description in the 'Content-type' header as a read receipt notification. When using this option, all read receipt notification emails will always be forwarded. If your SMTP server returns the error message like "Relay operation denied", try the following options. 1) At first, try the option "Add 'Resent-**' headers". This option adds the 'Resent-**' headers that shows this email is a FORWARDED email. This option may not be effective depending on the settings of SMTP server. This option is checked by default. 2) Only if 1) is not effective, try another option "Put my address into 'From:' header". With this option, your own name will appear on the receiver's mail list, but the original sender's address will be kept in the 'Reply-To' header and the receiver can reply by simply pressing the reply button. And the sender's email address info will inserted at the top of email messages. If you check the option "Don't add sender's info to email body", it will be disabled. The addition of sender's info is applied to only plain text emails. These options should be used to avoid connection errors or to handle the special cases. All options, except mentioned specially, should be unchecked. ForwardMail will not use UIDL command for comparing the incoming emails with the forwarding log in order to avoid to forward the same mails again. This option should be used if the error log, "POP server does not support the UIDL command", appears on the log. Unchecking this option is recommended strongly. If enabled, the receive time adjustment delay (about 1 second per receiving session) will be defeated. Use this option if the network connection with POP server is stable. If enabled, the send time adjustment delay (about 1 second per sent email) will be defeated. Use this option if the network connection with SMTP server is stable. ForwardMail will check the newest incoming mail first of all. This option should be used in case your mailbox has reverse order of mail list. That case is depending on the configuration of mail server. This is an obsolete option. Most current typical POP servers don't use this reverse order email listing. And if you use UIDL check mentioned below, it is not effective. The remote control command email, which has been sent to this account, will be ignored. About remote control features, see the help file of "General" tab.. This account will be set to 'remote-off' state when starting up. If receiving 'remote-ON' command, this account will be enabled. The plain/text or html emails which don't have any attached file will not be forwarded. Even if an email would pass through this filter, the other filters will be applied to the email. This option is available only when the 'Forward only MIME emails with attached files' option is enabled. If this option is used, the text message filed included in the email will be stripped out, and only the attached files will be forwarded. The error mails, which includes the description 'multipart/report;' in the content-type header or which includes the following descriptions in the subject header, will be forwarded. That option will be disabled for this account even if that option in 'General' tab is enabled. The email which caused SMTP error 550 or 552 will not be resended at next time. Usually once an SMTP error would occur, the email will be sent at next time. However, if the 550 or 552 error means the permanent error, the error will be repeated forever. This option can be used to avoid it. If this option is enabled, the partial (divided to several partial emails by an email client software) email will be forwarded after stripping the email message body. When using the mobile phone option, partial emails will be always filtered and this option will be invalid. All MIME parts of HTML mail will be converted to plain text and forwarded. If unchecked, only the first part of HTML/TEXT part of HTML mail will be forwarded. This option will be used when applying 'Filters by mail size' and unchecking the option "Always forward HTML mails". If enabled, unicode (UTF-8, 7) characters will be converted to ISO-8859-1 characters. If enabled, CRCF code will be inserted per 2048 bytes into the mail body. If disabled, CRCF code will be inserted per appropriate bytes (default: 72 bytes) . If enabled, the japanese KANA characters will be encoded to JIS characters. If enabled, non UTF-8 characters in a UTF-8 email will be converted to a single space character.